Omniscient narration is used to tell the story, and the manner in which we are introduced to the various characters is another manner in which I'm reminded of historical literature pieces. The characters have their background information given and are described by that all-knowing source, but it doesn't exactly feel like an info-dump. You learn quickly that King Maebus came to his position through hard work and apprenticeship. He did not want to be king, but the last king was a coward and ran when the major threat raised its ugly head. Kelm was his best friend, adviser, and the Grand Wizard. Both were good men and believed in the Realm. Damian on the other hand was a baddie who was passing out the right flavor of Kool-Aid to bring in the followers. He sounds like a good enough guy who makes a little sense until very early in the book when someone questions his methods. It didn't end well for that questioner. At all. 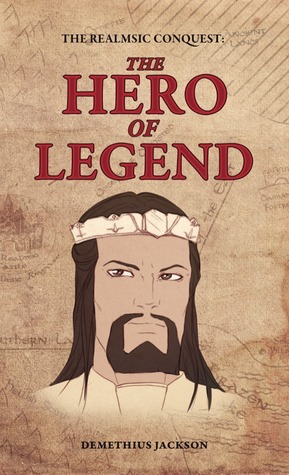 All in all, The Realmsic Conquest: The Hero of Legend was a good read, but I understand that it won't be for everyone. I enjoy epic fantasies and quirky writing styles, and it is well worth working through. However, people who are fond of neither will have trouble working through it. It's still worth the chance.